Two days after fire destroyed all the belongings of a a Linden secondary school student who has been preparing for CXC examinations, he on Wednesday received a much-needed computer to help him continue preparations. 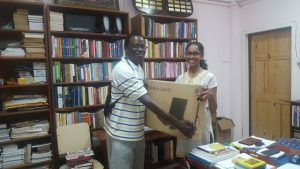 Mark Miggins, 17, was presented the computer by the Cornelia Ida, West Coast Demerara-based privately-owned school, Saraswati Vidya Niketan. Almost immediately after the house in which he lived at 119 Wall Street, Self Help Housing Scheme, Amelia’s Ward was razed, Miggins had expressed grave concern about the future of his academic studies because his computer containing his School Based Assessments (SBAs) was destroyed. Hours later, the Principal of the Saraswati Vidya Niketan, Swami Aksharananda reached out and successfully contacted Miggins. Arrangements were made for the computer to be handed over Wednesday. Miggings and eight other persons lived in the Lampkin family-owned two-flat house. One of the theories about the cause of the blaze is that one of the occupants lit a mattress, resulting in the house being gutted.